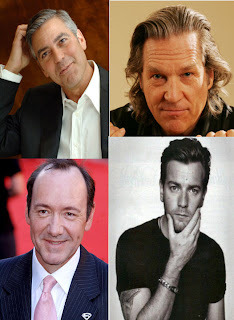 In what sounds to be a phenominal cast for Smokehouse Pictures Ewan McGregor, Kevin Spacey and Jeff Bridges will join George Clooney in "The Men Who Stare at Goats." The Hollywood Reporter is reporting that the trio are in final negotiations with the production company to star in the film based off the book by Jon Ronson and yes, we will see them star at a goat long enough they kill it! "In 1979 a secret unit was established by the most gifted minds within the US Army. Defying all known accepted military practice - and indeed, the laws of physics - they believed that a soldier could adopt the cloak of invisibility, pass cleanly through walls and, perhaps most chillingly, kill goats just by staring at them. Entrusted with defending America from all known adversaries, they were the First Earth Battalion. And they really weren't joking. What's more, they're back and fighting the War on Terror. 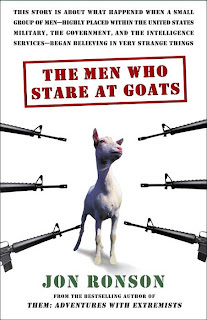 'The men who stare at goats' reveals extraordinary - and very nutty - national secrets at the core of George W Bush's War on Terror." The book is set in Iraq and centers on Bob Wilton (McGregor), a desperate reporter who stumbles upon the story of a lifetime when he meets Lyn Cassady (Clooney), who claims to be a former secret U.S. military psychic soldier who was reactivated post-Sept. 11. "Goats" chronicles the two men's travels through Iraq and offers glimpses into the supposedly real secret Army unit tasked with creating soldiers with paranormal powers. Bridges will play Bill Django, the founder of the psychic soldier program and Lyn's mentor. Spacey will play Larry Hooper, a former psychic soldier who is running a prison camp in Iraq. What are your thoughts on the first Smokehouse Production? This cast is stellar, how about the story though? Does super soldiers sound cool to you? I was in this unit. Its a good thing that talent like clooney,Spacey, and crew are doing it. We faced the unknown at will and often the results were nothing less than hilarious. The rest i leave up to your imagination. Clue # one... we work for the planet not George Bush.